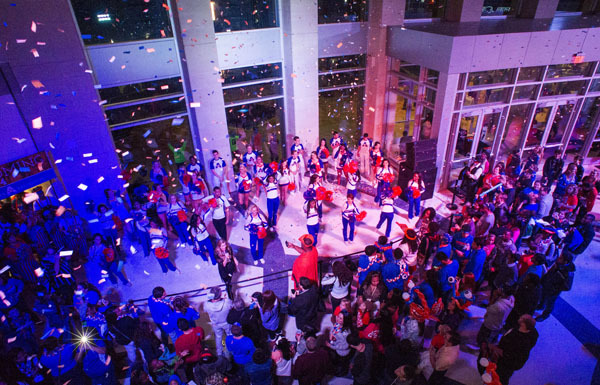 Inside action: College Park Center hosted Saturday's Homecoming events when rain caused the street festival and pep rally to move indoors. More than 4,000 fans cheered on the men's basketball team to an 87-69 victory over Houston Baptist. See more photos. Maverick pride filled College Park Center on Saturday as thousands of alumni, students, faculty, staff, and community members enjoyed indoor fun and festivities for Homecoming 2014. Events moved inside because of the rainy day, which didn't dampen the fun time on the concourse of College Park Center. Booths for the street festival lined the halls for afternoon activities and the pre-game pep rally. The Party on the Plaza headed to the Hospitality Suite, where alumni enjoyed food, beverages, and fellowship, plus reserved seats for the game against Houston Baptist. Tung Nguyen and Cynthia Heisch, marketing seniors, were crowned Homecoming king and queen in front of more than 4,000 fans at halftime. The Mavericks defeated Houston Baptist 87-69 on Petsche Court in College Park Center. Rain caused the parade to be canceled and the golf tournament and fireworks show to be rescheduled. The week included the Distinguished Alumni Awards, The Bash dance party, the chili cook-off, the step show, and alumni gatherings. UT Arlington is one of more than a dozen universities that will be included in a new White House initiative aimed at empowering teachers and students nationwide to use technology in the classroom. During a news conference Thursday in Washington, D.C., President Obama announced ConnectED, a program that partners with online learning platform edX to offer free professional development courses and their accompanying certifications to teachers, along with courses to prepare students for Advanced Placement exams. UT Arlington’s College of Education and the Learning Innovation and Networked Knowledge (LINK) Lab will offer one massive open online course, or MOOC, in 2015 called Technology, Literacy, and Diversity in Education. The course will likely be followed by additional courses through 2018. Candidates for dean of the College of Science will meet with administrators, faculty, staff, and students Monday-Friday, Dec. 1-5. 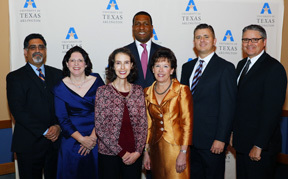 The Distinguished Alumni Awards became a new Homecoming event this year. From left, President Vistasp Karbhari, Lisa Karbhari, and honorees Serena Simmons Connelly, Fred Perpall, Vicki Tanner, Baron Concors, and James Greer. Also honored was Bruce Tanner. Read more about the 2014 Distinguished Alumni Awards honorees, and watch the video. The UT Arlington campus is closed for the Thanksgiving holiday Thursday-Sunday, Nov. 27-30. E.H. Hereford University Center—The center will close at 7 p.m. Wednesday and open 1-11 p.m. Sunday. Libraries—Libraries are closed Thursday. Check the library schedule for hours on other days. Share your opinions on Dining Services at an open forum noon-1 p.m. Monday, Dec. 1, in the Rio Grande Ballroom of the E.H. Hereford University Center. Join Loan Ho, Student Congress president; Timothy Quinnan, vice president for student affairs; and the Dining Services Task Force for thoughts, ideas, and free pizza and drinks. Meet the authors from UT Arlington at “An Evening with Authors” hosted by the Center for African American Studies. 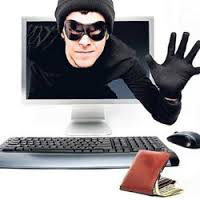 The program is 5:30–7:30 p.m. Wednesday, Dec. 3, in the Carlisle Suite of the E.H. Hereford University Center. Copies of literary works will be available. RSVP to caas@uta.edu by Friday, Nov. 28. The North Central Texas Council of Governments Transportation Department, in partnership with the Texas A&M Transportation Institute, is asking travelers of Interstate 30 about how incentives might influence their trip choices. A survey is online at I-30survey.org until Nov. 30. 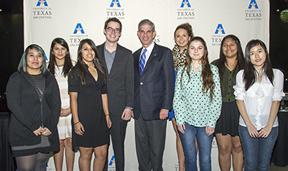 Former UTA President James Spaniolo, center, visited campus last week to honor scholarship winners. New recipients of the Spaniolo First Generation Scholarships are, from left, Tania Garcia, Jaqueline Ramos, Kelly Zarate, Connor Torrealba, Madison Maynard, Britney Berger, Victoria Cortez, and My Tien Bui. Today's TrailBlazer is the last issue until after Thanksgiving. The next issue is Tuesday, Dec. 2. Planetarium Closed Thanksgiving Day. The fall schedule ends Nov. 30 and includes Astronaut; One World, One Sky: Big Bird's Adventure; Pink Floyd; Spacepark 360 Infinity; Two Small Pieces of Glass; and We Are Astronomers. The winter schedule, Dec. 4-21, features Season of Light; Holiday Music Magic; Back to the Moon for Good; Experience the Aurora; One World, One Sky: Big Bird's Adventure; Pink Floyd; and Spacepark 360 Infinity. Planetarium. The men’s basketball team defeated Houston Baptist 87-69 Saturday night in the Homecoming game before 4,163 fans at College Park Center. Senior guard Jamel Outler paced the Mavericks with 26 points, including seven 3-pointers. UTA made a season-high 13 of 21 from beyond the arc. Sophomore guard Drew Charles and senior guard Lonnie McClanahan added 12 points apiece. The win improves the Mavericks to 3-1. They face top-ranked Kentucky in Lexington at 6 p.m. today, Tuesday, Nov. 25. Watch the game on the SEC Network. The Mavericks lost for the first time this season, falling 71-61 Saturday night to Wichita State in Wichita, Kan. Freshman guard Cierra Johnson led the way with 17 points. Freshman center Rebekah Van Dijk added 13 points and a game-high 16 rebounds. Now 2-1, UTA hosts Northern Arizona at 7 p.m. Wednesday, Nov. 26, at College Park Center. UTA ended its regular season with a 3-1 victory Friday night on the road against Georgia Southern. The win puts the Mavericks at 24-8 this season and 14-6 in Sun Belt Conference play. Junior outside hitter Hannah Baptiste registered a team-high 11 kills to go along with seven digs. Next up is the SBC Championship in San Marcos. UTA finished fourth in the regular season and is the tournament’s No. 4 seed. The Mavericks face fifth-seeded Appalachian State at 2:30 p.m. Thursday, Nov. 27, in first-round action. Upcoming entry deadlines for intramural sports include MavStrong, Wednesday, Dec. 3; and CollegeFB Bowl Pick 'Em, Saturday, Dec. 13.